Tea tree (Leptospermum scoparium): growing, planting, caring. A lovely shrub - alas sensitive to frost. Leptospermum scoparium -the tea tree - is a species of flowering plant in the myrtle family Myrtaceae, native to Australia and New Zealand. It is an evergreen shrub growing to 2–5 m (7–16 ft) tall with dense branching and small leaves and white, sometimes pink, flowers. Numerous cultivars have been developed for garden use, like ‘Kiwi’, 'Nichollsii Nanum’, or ‘Red Damask’. Leptospermum are bushes, shrubs and sometimes trees, usually 2 to 3 meters high, with a thick branching. The leaves are alternate, simple, pointed, small. 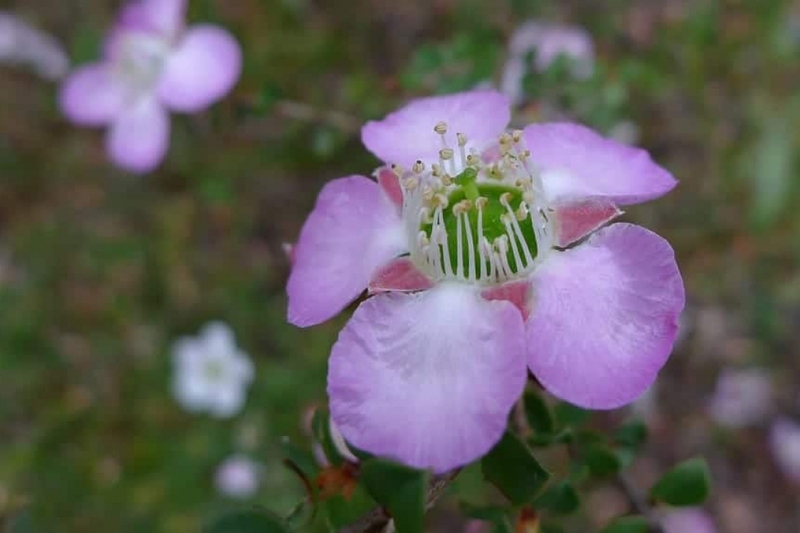 The flowers have five petals, white, pink or red. There are many horticultural varieties, some with double flowers. The flowers are very melliferous - fantastic for bees early in the season! Place your leptospermum in a sunny, semi-shade position in a well-drained neutral acid soil. Plant in open soil in the spring so that it is sufficiently rooted to withstand the first winter; in regions where the frost reaches -10 ° C, it should be grown in pots in order to protect it from frost in winter. To help it through winter, protect your plant from cold winds — these are its only real enemy! — by spreading a good layer of mulch at its base. In this manner, even in the case of heavy frosts, new branches will sprout from the plant. If your plant is potted, shelter it from winds by moving it closer to a wall, by potentially raising it from direct contact with the ground, and if possible, protecting the pot itself by wrapping it with burlap, and possibly stuffed with straw. Water regularly and generously for several weeks after planting, and a little bit in the first summer. After, you only have to worry about watering if your plant is potted. Outside of these conditions, it will manage on its own, even handling dry soil better than moist soil. If you keep your tea tree in a pot, plan a repotting every 2 to 3 years if possible, in some potting soil and a slightly larger pot. If you can't change the pot, scrape and remove the upper layer of the soil, and replace it with new potting soil or well decomposed compost. Prune your plant lightly after the end of flowering for rebalancing, or to limit its growth. Only twigs still young from 1 to 2 years old should be pruned because the old wood does not regenerate. Trim right after flowering, otherwise there is a risk of delaying the next flowering!